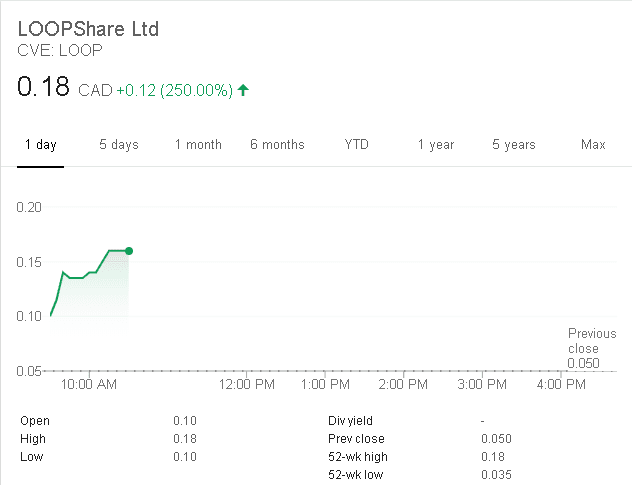 A life-changing day for shareholders of LOOPShare LTD, which is up as much as 250%, thanks to the news that LOOPShare just acquired Ray J’s scooter brand. Ray J will be the ambassador for the LOOP scooters, going forward. The company opened the day at CAD$0.05 with 81M shares outstanding, for a market cap of CAD$4M. Even after this dramatic price action, the entire worth is only CAD$13.77M at this point. As I said, Bird, a privately-held scooter company, was the fastest company ever to reach $1B valuation, and we are a long way from this. Ford Motors acquired Jump, which markets electric bikes, for $80M just recently. The fact of the matter is that with Ray J, a top-performing singer, a social media influencer, and a business mogul on his own right on board, the marketing arm for this company just got a serious boost. After talking with the founder of the company just an hour ago, I can tell you that this is an extremely scalable business, which can grow in 2019 to the point that you wouldn’t recognize it, compared with today. Make sure you read our full profile on this company HERE. The founder and I ran a simulation on numbers, using average mileage trips, the number of scooters already owned by LOOPShare, accounting for repeat business, seasonality, and life span of the e-scooters. It’s mind-boggling, and I wouldn’t be surprised if auto manufacturers start taking a serious look at this industry in a similar way to how tobacco companies have begun acquiring cannabis operators. Micro-mobility is the future, and LOOPShare LTD (TSX-V: LOOP & US: LPPPF) is the only publicly-traded ride-sharing company of its kind. I’m officially raising our buy-up price, significantly, because of these critical developments, both with Ray J’s involvement and due to the clear undervaluation, as we see it, at this point. Consider becoming one of the earliest shareholders in what could be the next big trend in urban transportation! Remember, as the economy slows and the price of gold rises, auto manufacturers will be under the gun to show they can dig their way out of this slump, but Loop Scooters are so affordable, easy to use, and advanced that big, old Ford vehicles can’t compete in downtown areas. This is a potentially hyper-growth story, right when the economy is rolling-over. It could become our biggest winner ever! North Korea Showdown: Pivotal Turning Point!